Last Sunday, Daddy and I came home from our weekend away in NYC at BlogHer. You had a fabulous time with Nana and Papa.You went to the local amusement park, a science museum and to see Toy Story 3 again. I actually think you thought twice about coming home. Then we opened up a bag with some new items in it. That was the moment that you learned a new word – SWAG. Yes, at three you probably assume that is we go away Swag will follow us home. 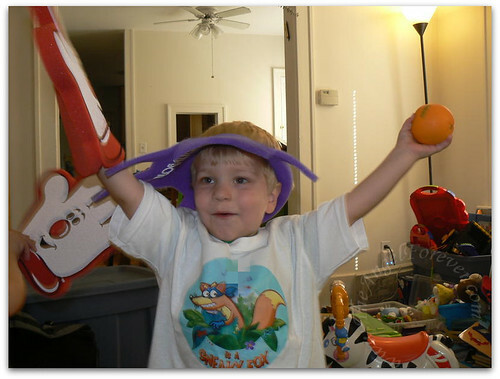 Thank goodness you were so amused with the fabulous Swiper shirt from the people at Nick Jr. that we hid some items away for another time. I have a cupboard full of birthday and Christmas gifts for the grands! JSL is adorable and the epitome of Swag Happy!